Using visuals to understand the business offering and its evolution. I do so enjoy doing a wordle (www.wordle.net), they make you feel a whole lot clearer on what and where any focus might be, or has been, from a perspective of my business and how it is evolving in content and areas of value for any innovative offering to clients. 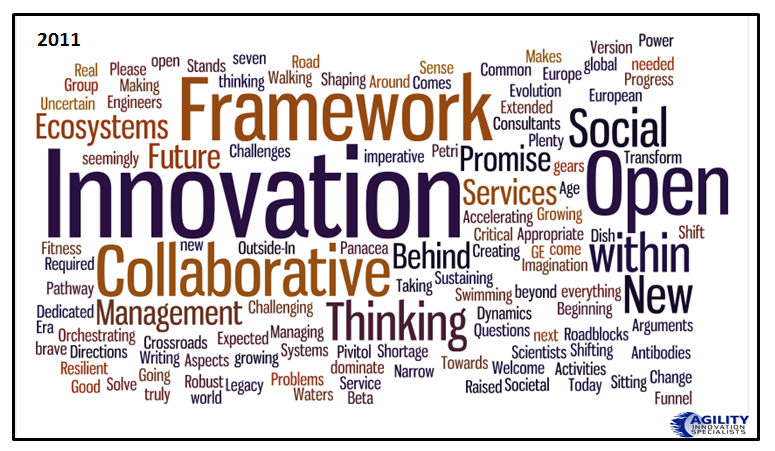 Towards the end of a calendar year I like to always look back and reflect, to see where my innovation activities have headed. Did they add value, did they move innovation and my thinking forward? 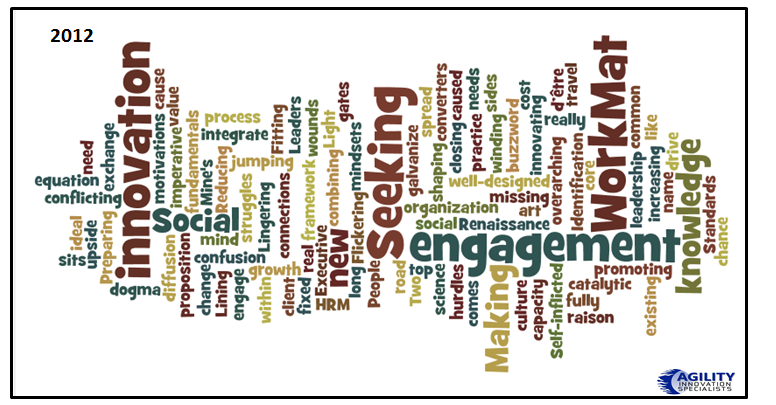 I think initially exploring these within a wordle does help make the critical focal points stand out. So here are mine that reflect where I am in what I am exploring and looking to increasingly work with clients upon. I thought I’d share the evolution of how this is evolving, I hope positively for all concerned. What does this say to you? For me it keeps reminding me to keep pushing and searching for unique differences, it constantly recognizes it is the relevant jobs-to-be-done that should make up the activity I investigate and want to engage with through my advisory and consulting work. All clients do have unique issues to resolve as their circumstances are always different yet there are common framing points to engage around. The other wordles I put together is on the blogs I’ve written during the course of the last three years to see if i can detect an evolution. These have seemingly gone through three critical phases, in 2010, in 2011 and to-date in 2012. This has been far more about engagement, in seeking out through the executive innovation work mat and other activities. This work mat approach is an extension on earlier work on exploring different types of innovation and recognizing organizations continue to struggle in aligning their innovation activities to the strategies and goals and these frameworks are trying to reduce this often series of mismatches and then not delivering to the needs of both the organization and the final consumer, innovation that makes a valuable difference. I think this reflective view in visuals helps me formulate what comes next, in 2013. What patterns can be seen, what needs to be developed even further? That needs to be worked through in the coming month so early 2013 I can begin to explore the new aspects drawn from this and other analysis I’m undertaking. 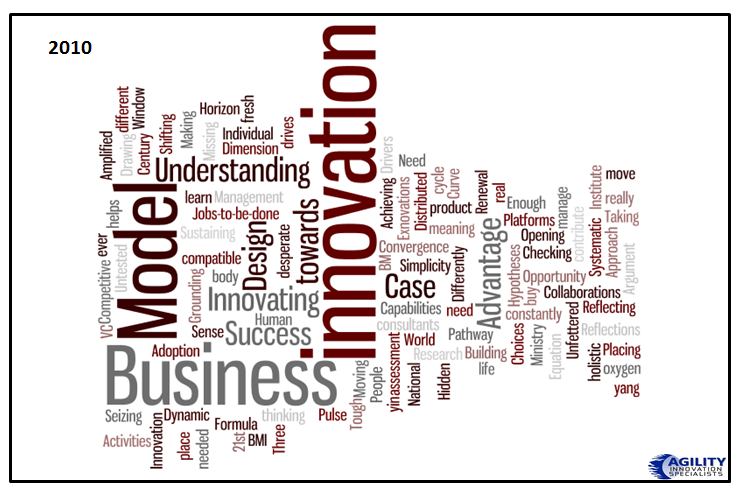 These then should ‘translate’ into a new vein of blogs and articles that continues to explore the DNA of innovation. Anyone got some observations from these? I’d like to hear them. 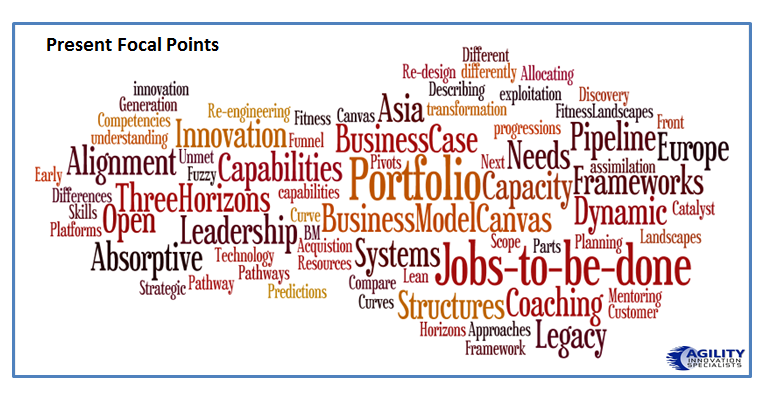 This entry was posted in Molecules and tagged capabilities and capacities that build innovation, innovation themes, the focal points of innovation value, unique offerings for innovation, visuals for innovation. Bookmark the permalink.